Buy Now! On Sale $19.95! 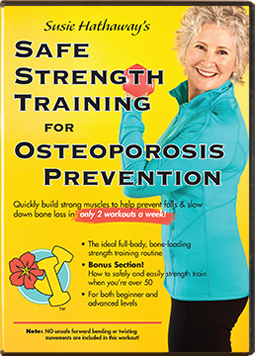 Safe Strength Training for Osteoporosis Prevention DVD, $19.95 on Sale! 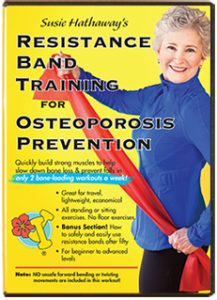 Resistance Band Training for Osteoporosis Prevention DVD, $18.95 on Sale! Bones and muscles respond well when you vary your workouts. If you only have one of my DVDs and are ready to add variation to your strength training, here’s your chance to save $5 and have both of my DVDs. Give the gift of health to yourself or a loved one. Remember, only two workouts a week will build the strength you need to stay vibrantly active and independent in the 2nd half of your life. Buy Now! On Sale $18.85! If you’re having a hard time fitting exercise in, find a friend and make a date to strength train. Stay accountable to her so you’ll get it done. It works! Many of my class participants get together with a friend when my classes aren’t in session. Their bodies and bones stay at a high level of fitness over the holidays. What works for you to stay active between Thanksgiving and New Year’s Day? Let us know! Thanks! 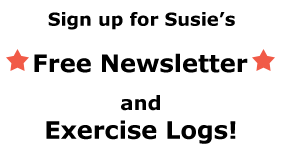 ← “When to Get a DXA and How to Interpret the Results” Free NOF Webinar! I am in my 70’s. I have been working out off and on (at home, on Nautilus equipment at a gym and in classes) for 2 decades to combat low bone density. I was recently introduced to Susie Hathaway’s videos by a woman in a yoga class for strong bones. I love the video “Safe Strength Training for Osteoporosis Prevention”! It is very well produced with a clear coaching section and a separate section to workout along with. It is very motivating, similar to exercising along with a friend or a class, easy to use for a workout, and very bone safe. I would like to find a similar DVD/video (or even audio CD) consisting of iyengar style yoga poses to strengthen bones on the days in between using “Safe Strength Training”. I own the books “Dynamic Dozen: 12 Accessible Yoga Poses for Building Bone Density, Strength, and Balance” by Tim Keim and “Yoga for Osteoporosis” by Dr Loren Fishman (and his youtube video). Both give descriptions of bone-safe poses but are not easy to use for workouts. But most yoga DVDs include a lot of poses unsafe for osteoporosis, such as forward folds and spinal flexion. Diana, Sherri Betz, PT, has a “Yoga for Osteoporosis” DVD. I haven’t seen it, but she specializes in bone-safe physical therapy and Pilates.